Mahendra Singh Dhoni is considered to be one of the best wicketkeepers in the world. He is known for his quick hands behind the wickets and has helped team getting wicket out of nowhere due to a small mistake by the batsman. He has the distinction of recording some of the quickest stumpings in cricket. Even in the first ODI, he plotted the dismissal of Trent Boult with Kuldeep Yadav. Against New Zealand in the second ODI, the spectators again witnessed his lightning-quick stumping. India posted a good total of 324, owing to a strong start by Rohit Sharma and Shikhar Dhawan. After their fall of the wicket, India lost a bit of momentum and couldn't accelerate. A late flurry of runs by MS Dhoni and Kedar Jadhav took the total to 324. Chasing 325 to square the series, New Zealand had a poor start when they lost Martin Guptill and Kane Williamson in the first powerplay. Colin Munro also got out in the 15th over of the innings and it was left to Ross Taylor and Tom Latham to execute the chase. The talking point of the match came into the 18th over when Kedar Jadhav came into the attack. On the first ball of the over, Taylor became the victim of MS Dhoni as he lost his balance for just a split second. Taylor played for the turn but, the ball didn't spin and went past the outside edge. It was enough for Dhoni to do what he does best behind the wickets. 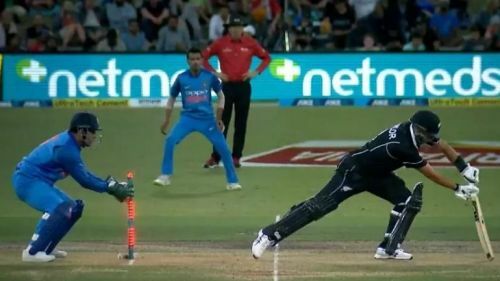 Such a fast stumping erupted reactions all over social media, as many cricket pundits and fans expressed their wonder at Dhoni's skill. You miss, I hit .